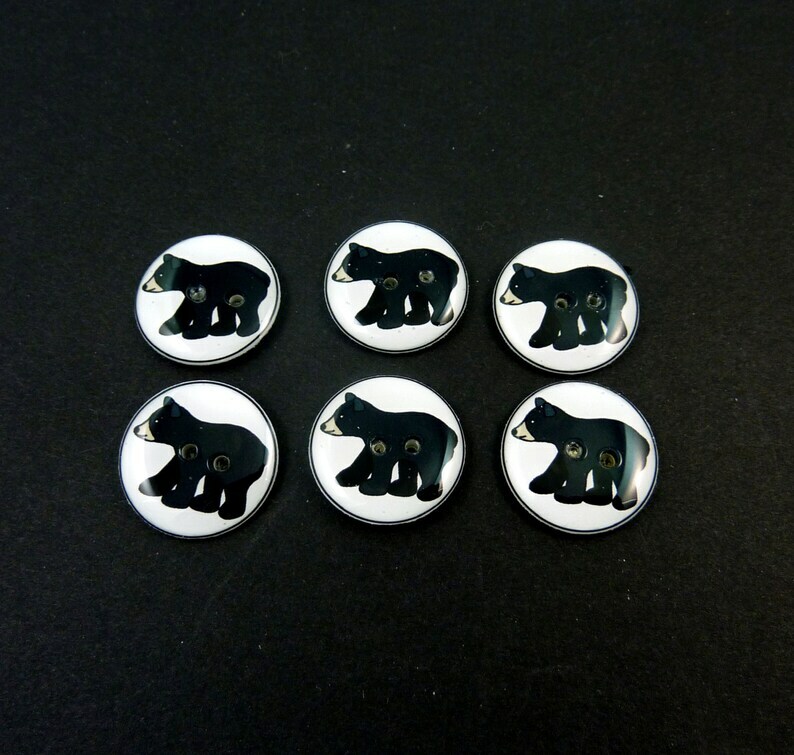 6 Black Bear buttons. Handmade By Me. Animal Buttons for Sewing. Washer and Dryer Safe. 6 handmade buttons. Black bear buttons. These sewing buttons are washable and can be used anywhere you would normally use buttons. In addition to clothing you can use them for knitting, scrap booking, card making or even making hair accessories. My buttons are unique and are not available from anyone else. If you want something very special to add to your handmade item you've come to the right place. These work well for knitting because they are very lightweight and won't sag when attached to your garment. Like all my buttons, these buttons are all handmade by me one at a time in my home studio. I use archival safe materials which makes these buttons a great option to use on your handmade heirloom items you may wish to hand down through the generations. If you are going to take the time to make handmade items why not add that extra special touch of handmade buttons that aren't readily available everywhere. Why not use buttons as unique as your handmade item. This will make your handmade items just that little bit extra special. Since my buttons are made with archival safe materials they can also be used safely in your scrap book projects. My buttons are washer and dryer safe with no special care required. CHOOSE SHANK OR TWO HOLE STYLE - When you add the buttons to your cart you will be able to choose from shank style (metal shank on the back to sew on your buttons - NO HOLES) or a design with TWO holes. The last three pictures are of the shank style buttons (no hole). These use images from Country Clipart. The buttons pictured here are handmade by me in my home studio. If you want to use my buttons to add to clothing, or use them to make hair accessories, button jewelry or other items for your Etsy shop or elsewhere that's no problem. I love to see my buttons on items that you make. My buttons have been purchased by many button collectors and have been used by doll artists, jewelry/jewellery makers, quilters, fibre artists, paper artists, card makers and clothing designers. Their use is limited only by your imagination. 6 Blue and Green Cheerleader Buttons. 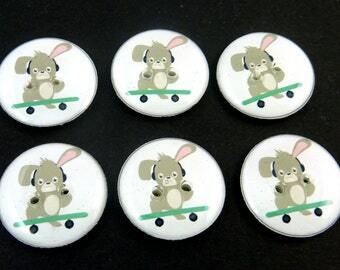 6 Rabbit or Bunny on Skate Board Buttons. 3/4" or 20 mm round Buttons for Sewing. Washer and Dryer Safe. Easter Buttons. 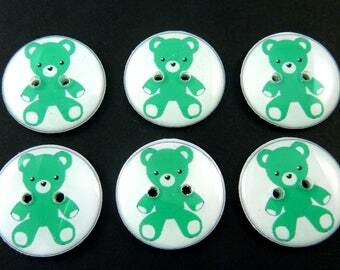 6 GreenTeddy Bear Buttons. Sewing buttons. 3/4" or 20 mm. Washer and Dryer Safe. Children's Buttons. 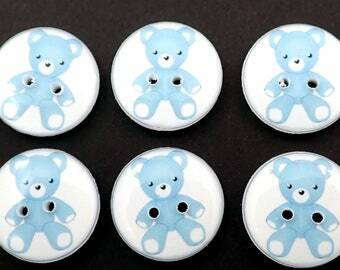 6 Blue Teddy Bear Buttons. Sewing buttons. Washer and Dryer Safe. Children's Buttons. 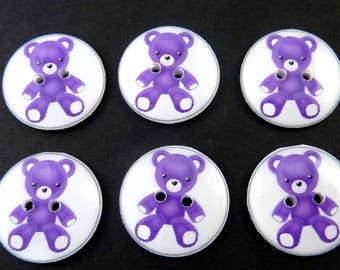 6 Purple Teddy Bear Buttons. Sewing buttons. Washer and Dryer Safe. Children's Buttons. 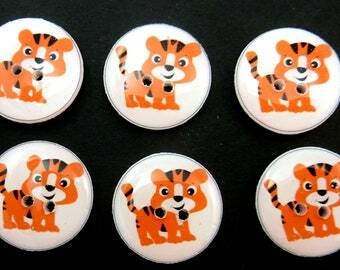 6 Tiger Buttons. 3/4" or 20 mm. Novelty Zoo animal Buttons Handmade By Me. Washer and dryer Safe. 6 Monkey Buttons. Handmade Buttons. Washer and Dryer Safe. Choose Your size. 6 Deer Buttons. 3/4" or 20 mm Round. Washer and dryer safe. 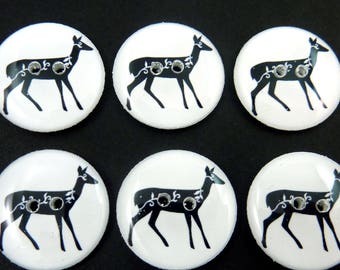 Black and White Deer Sewing Buttons. 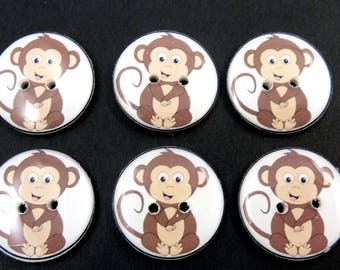 6 Monkey Buttons. Monkey and Banana Handmade Buttons. Washer and Dryer Safe. Choose Your size. 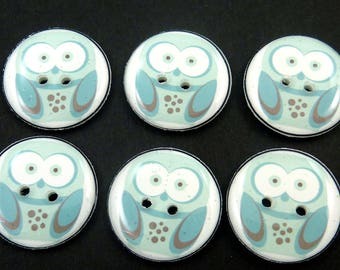 Blue Owl Buttons. Handmade Buttons. Washer and Dryer Safe. 3/4" or 20 mm Round. 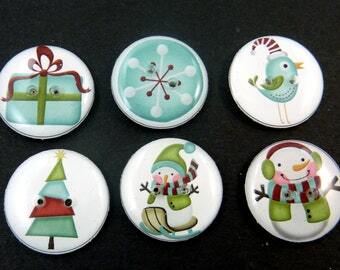 6 Snowman and Christmas Buttons. Handmade By Me. Washer and Dryer Safe. Christmas Tree, Snow Flake, Bird 3/4" or 20 mm Round. 6 Halloween Turtle buttons. Handmade buttons. 3/4" or 20 mm. Witch Turtle Sewing buttons. Washer and Dryer Safe. 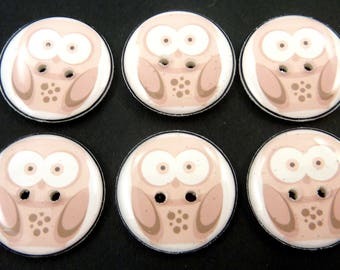 Pink Owl Buttons. Handmade Buttons. Washer and Dryer Safe. 3/4" or 20 mm Round. 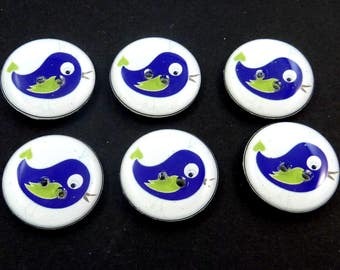 6 Purple Bird Buttons. Handmade Sewing Buttons. 3/4" or 20 mm. Washer and Dryer Safe. 6 Hippo Buttons. Handmade Buttons. Washer and Dryer Safe. 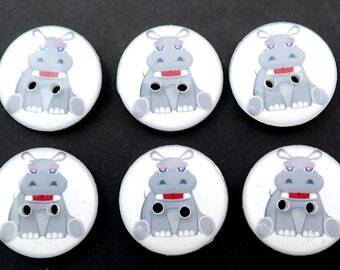 Hippopotamus Buttons.